"Harris & Martin large format full colour hardback. 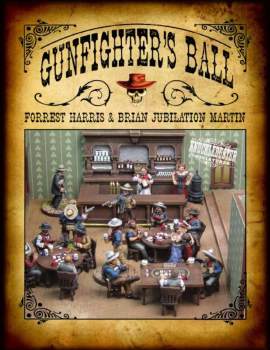 Gunfighter's Ball is a fun, fast-paced tabletop miniatures game of the Wild West. This book contains all the information needed to stage action-packed shootouts, including: Quick character generation and the ability to individualize them with special abilities and quirks Simple, intuitive game mechanics that can be enhanced with optional rules for added nuance and realism Scenarios of varying length for groups between 2 and 12 players Tips to help the Judge run memorable sessions and create scenarios of their own A section on how to paint miniatures These hardbound, full-color rules tie into a full range of Gunfighter's Ball figures, buildings, card decks, etc available from CALIVER BOOKS"